So, you know how to kitesurf. You now have quite a few sessions under your belt, you know how to pick and set up a kite, and you can ride upwind reliably. You bought your own gear, and you have some free time for kiting. Problem is, due to your job or your personal constraints, your free time is mostly on weekdays. In a way, that’s a good thing because you get to avoid weekend crowds, but every time you get to the beach, you’re the only kitesurfer around! In this post, we’ll look at some of these aspects to help you understand how risky or reasonable it is for you to kitesurf on your own. Before I move on, I just want to say going out to kitesurf on your own is a risky proposition. I personally almost never go kitesurf alone unless I have no alternative and the conditions are perfect (read on for more about what this means). The amount of risk involved in kitesurfing by yourself is greatly related to your kitesurf level and experience. I’ve been kitesurfing for 8 years, so I’ve been through a few incidents, and have learned to handle them. I’ve been very lucky, however, to have fellow kitesurfers helping me each time I’ve experienced problems – I always try to help others as best as I can. A lot of different things can happen when kiting, not all of which I would know how to handle, so I’m aware of the risk I take when going out alone. Why is kitesurfing on your own riskier? So what’s the big deal about kitesurfing alone? Aren’t you on your own out there anyway? There are actually many situations in which a fellow kiteboarder’s help can save the day – not just for catching your board and dragging it back to the shore. If you’re in trouble and have lost your kite and/or board, an experienced kitesurfer can have you grab his/her harness handle and tow you into the beach. Even if s/he doesn’t have the skills for it, he’ll get help for you, e.g. ask a rescue boat or someone on a paddleboard to come for you. Fellow riders can also catch your loose kite after you let go with it, and prevent your lines from hurting other people or causing damage. Last but not least, fellow kiters will help you launch and land your kite safely, avoiding possible accidents from occurring when the wind is strong. Normally, you ask a fellow kitesurfer to hold the kite up for you as you launch it. The first challenge you’ll encounter when going kitesurfing alone is in launching your kite. There are several ways to self-launch your kite. One of them is to hook up your control bar to a stake, hook, or car tow bar. You then walk up to your kite and launch it, then run back to the stake/tow bar, take the chicken loop off the fixed bar and quickly slide it onto your harness hook. This technique works well, I’ve done it many times, especially when everyone else is already out on the water. The riskiest part is obviously the moment when you slide the chicken loop off the stake to slip it onto your harness. A sudden wind gust can easily pull the bar off your hands or keep you from pulling the chicken loop onto your harness hook. Another common technique is, after setting up your lines and hooking them up to your kite in the sand, you step away from the kite to tense up the lines and around the kite pulling the lines sideways, turning the kite slowly to face the wind and start moving until it launches. Here again, strong gusts can potentially make things go bad, with your kite possibly steering into the power zone, sweeping you off your feet and dragging you down the beach or into obstacles. Self-landing is also challenging in strong and/or gusty wind. In moderate wind, you can trim your kite completely, steer it down until its ear touches the ground, then grab one of your front lines and walk up the line, then jerking the line firmly to tip your kite over face down on the sand. In stronger winds, however, pulling that front line while your kite is hovering over the ground is hazardous as a gust may brutally relaunch the kite while you’re walking up the line, potentially cutting your hand and making you lose control as the lines tense up with strength. Another common self-landing technique is to trigger your quick release, which will flag your kite and leave it hanging powerlessly off your harness on a single line. This approach is usually safe assuming you have enough clearance downwind from you. It does put a lot of stress on the remaining line, which could snap under some circumstances. Putting back the quick release in place after triggering it also takes a lot of time and patience. So both self-lanching and self-landing involve risk in stronger or gusty winds. With time I’ve come to master these techniques quite well, but every time I use them I’m well aware there’s a probability of failure with unexpected consequences. One of the main challenges for kitesurfers looking to go out by themselves is making a correct assessment of the current conditions. Typically, the first thing a kitesurfer does when reaching his/her local spot is to ask other kitesurfers what the wind is like and what size kite they’re setting up (and with what kind of board). Unless you’re the first person on the beach, there will typically be someone riding on the water you can observe to see if the kite size they’re using is right or if the rider looks overpowered or underpowered. That’s an important part of most kitesurfers’ decision-making process for gear choice. If you’re alone on the beach, however, you can only rely on yourself for making the right choice for kite size. You need to assess wind speed and direction. A wind meter can help you, but your own experience is what dictates the size you choose for given conditions. 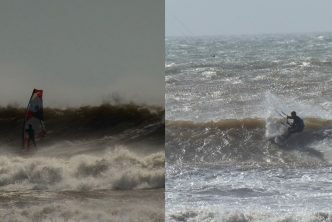 Kite size can obviously have a major impact on how well or how bad your session can potentially go. The impact is even higher if you’re alone since you can only count on yourself if you get over or underpowered. You have much less room for error. Likewise, you have to very carefully evaluate wind direction. Use your ears to determine wind direction: move your head until you successfully balance out wind noise between your 2 ears – then you’ll be looking right in the direction the wind comes from. You can also throw some sand up in the air and observe its direction, observe the trees or flags around you, or pump up your kite and rest it against the wind. Make absolutely sure the wind is NOT blowing offshore or side off, only go out alone if the wind is onshore or side-on. Again, determining wind direction is much easier when there are a bunch of people out riding or setting up. Even if the wind seems right, it may change over the course of your session. Did you check the wind forecast? Do you know if the tide typically impacts wind conditions in the area you’re in? Beware of very light winds, they’re probably the worst thing that can happen to a solo kitesurfer. Fledgling wind will make your kite drop and potentially make it impossible to relaunch. Another thing you’ll need to correctly assess is water conditions. Kitesurfing alone is much less risky if you’re familiar with the spot. 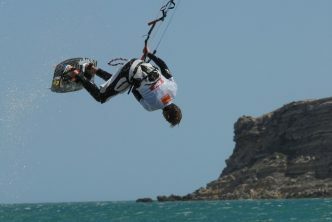 If you’re not, and there’s no other kitesurfer around, try to ask a local or fisherman about sea (or lake) conditions. What is the current tide, is it going in or out? Are there rocks in the water emerging as the tide goes out? What are the currents like? Is there a pass with strong rips? Also, ask yourself what the waves are like. Is it a sheltered spot or is it sensitive to swell? Is a swell coming in? Are the waves getting bigger? If no-one else is kitesurfing, maybe they know something you don’t! So make absolutely sure you know what you’re doing. A bigger kite than usual: as mentioned earlier, having your kite fall and not relaunching when the wind drops can be quite bad, especially if you’re far offshore. If you’re riding alone, use a bigger kite than you otherwise would. A warm wetsuit: you never know if and when you’ll lose your kite and/or board and drift in the water for a long time (possibly hours) until you reach the shore – assuming wind and current push you toward the shore, which should be the case if you’re smart. See my recommended wetsuits page. Board leash: while wearing a leash can be dangerous because the board may come back and hit you in the head, I find a leash to be a safety item as it keeps me from losing my board. If in serious trouble, being able to hold on to my board and float on it is crucial. A line cutter: it may save your life someday if your lines get tangled up in your harness and your kite goes into loops, or something gets caught on a rock. I always have one stashed in my harness pocket. See the hook knife section of my recommended safety gear. A helmet and/or a life jacket: I know, who wears those… But if you’re kiting alone in big-ish surf and strong wind, and you get knocked unconscious, you’ll be glad you did. I personally bought a special above-the-harness float jacket for these special occasions. Check out my recommended safety gear. Not to be a doomsayer, but a lot of things can happen when kitesurfing on your own – sure they can also happen while around other kitesurfers, but you know … Murphy’s law. Fellow kitesurfers can usually help you in one way or another, by getting help, dragging you towards the shore, getting your board for you, or just giving you encouragements and moral support – you wouldn’t believe how important that is – while you swim back to shore during hours. So if you do decide to kitesurf alone, make sure you’re well prepared, do your necessary homework beforehand, have the right gear, and avoid going farther offshore than you can swim. But most of all, if you can, try to find buddies to go kitesurfing with! It’s so much more fun, too. 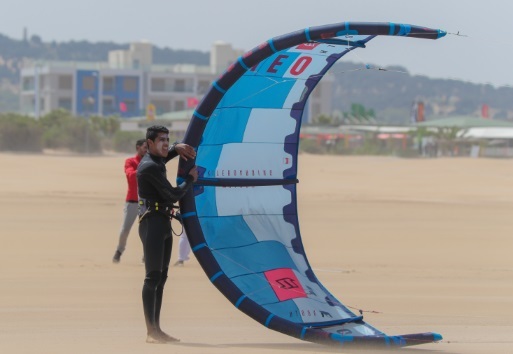 Kitesurfing vs Windsurfing: Which One Is Best For You?